When Black Gold Farms hired me to come up with a Shrimp Boil Recipe I was excited about the fun concept but was pretty sure that I wouldn’t like the boiled food. I was so wrong. Has a food ever surprised you? Has something that you expected to just be so-so (or even kind of dreadful) ever turned out to be crazy delicious? When we moved from Toronto to Florida we couldn’t take our alcohol with us. We chose a few special bottles and with the rest, we had a farewell party that nobody could ever forget. They couldn’t forget it because it was fun. And because it was flavored with Pimm’s. You see, my husband is British. In Britain, a lot of young ladies sip on a strange liqueur called Pimm’s. When my in-laws fly over to see us, they often stop at the Duty Free and buy me a bottle of Pimm’s. But since nobody in North America drinks the stuff, the bottles had gone mostly unopened. Thus the Pimm’s flavored party. Here’s the thing about Pimms and lemon-lime soda (the way it is often consumed): It tastes like cola that’s gone flat. Everyone who came to our party was excited to give it a try. But they were all skeptical. I mean, how could flat cola be good? And yet, after tasting it every single one of them said, “Oh yeah. You’re right! It tastes like flat coke. But in a good way.” And then they’d look into their drink with a puzzled expression and taste it again, nod their heads at the glass and then sit back to chat. I was game though because the whole concept of a shrimp boil sounded like fun. I loved the idea of lining the table (or yard!) with newspaper and emptying big pots of food onto it. Festive, right? So while I wasn’t super-keen on the boiled food idea, I was beyond excited about the fun my family would have eating it. I lined our kitchen table with plastic garbage bags and newspaper. I gave everyone a paper plate and then tipped the pot into the middle of us all. The kids giggled hysterically at their mommy dumping food directly onto the table. And they loved using big tongs to reach in and grab what they wanted. So I was right about the fun. But I was wrong that the boiled food aspect of a shrimp boil would be bad. It was delicious! The corn was sweet. The red potatoes were vibrant and had soaked up extra flavors from the cooking liquid. The shrimp were tender and juicy. The chunks of onions (which I had only included to flavor the broth) were gobbled up by the kids and us parents alike. The whole cloves of garlic that I included were soft and we squeezed them onto everything like a condiment. And the sausage. Boiled sausage? Goooooood! It had added its flavor to everything and so, when you bit into the sausage itself, it matched up with all the other mouthfuls and made you drool for another bite of everything. I’ve made the shrimp boil a bunch of times now, for my parents, for friends and again just for the four of us. Every single time everyone has had so much fun and has gushed about how delicious it all is. As much as Pimm’s surprised my friends at our farewell party, I was surprised by the amazingness of a shrimp boil. 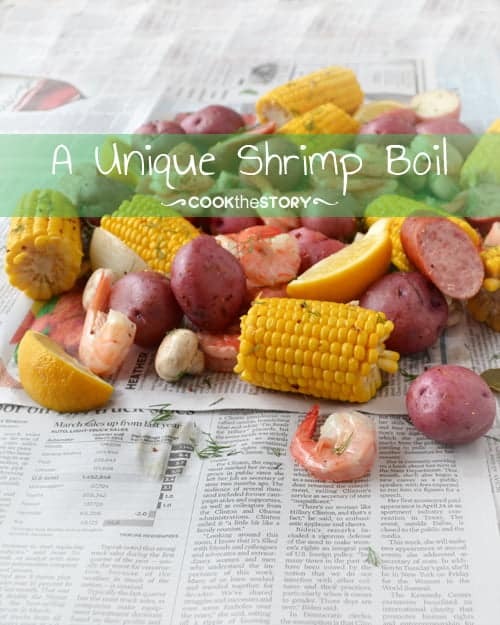 And now I’m going to share this surprisingly delicious shrimp boil recipe with you. 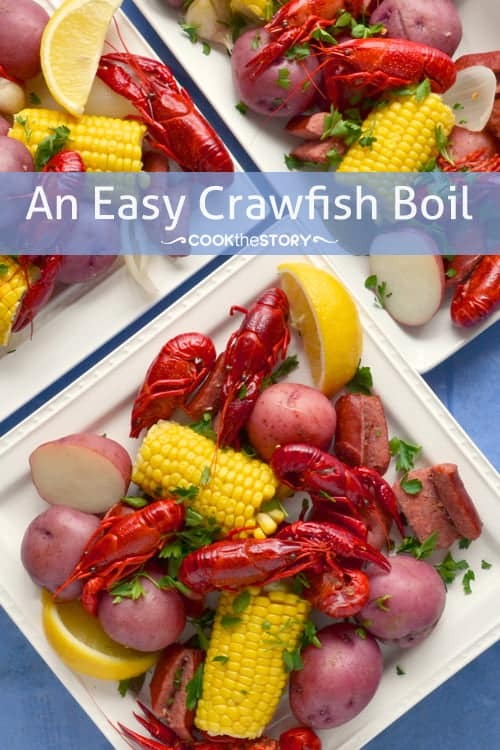 If you love an easy seafood boil, be sure to also check out my recipe for a low country crawfish boil. Don't let the long-ish list of ingredients here fool you: This recipe is easy! You basically just throw everything into a pot (but not all at the same time! Read the instructions!). There's very little chopping or cutting or any kind of prep involved. Fill a large pot with 6 quarts of water. Cut the whole lemons in half. Squeeze the juice into the water and add the squeezed lemon halves as well. Add the garlic, onion, mustard, 1 tablespoon hot sauce, bay leaves and salt. Tie the thyme and half of the dill into a bouquet using kitchen twine. Add it to the water. Stir well. Cover and bring the water to a boil over high heat. Reduce heat to low and simmer 5 minutes. Add the potatoes. Cover and cook until they’re just tender, 9-10 minutes. Add the kielbasa, mushrooms and corn. Cook covered for 5 minutes. Stir in the shrimp and cook covered until pink, 2-3 minutes. Meanwhile, chop the remaining dill fronds. Scoop out 1/2 cup of the cooking liquid. Add the butter to the liquid and stir until it melts. 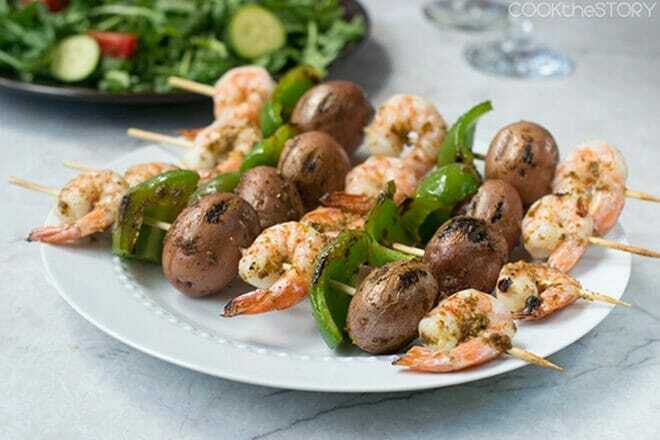 Use a slotted spoon to transfer the shrimp, sausage and vegetables to a large platter. Discard the herb bouquet. Drizzle with the butter mixture. To Serve: Cover a table with newspaper. Pile the shrimp, sausage and vegetables right on top, or leave everything on the platter. 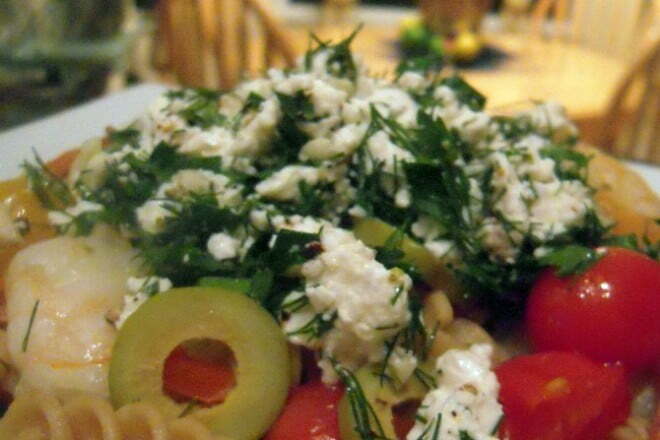 Sprinkle with the chopped dill. Put out the lemon wedges and hot sauce. Squeeze the garlic cloves from the skin as a condiment as well. Make sure there are a lot of napkins on hand before you dig in! A wine-pairing for the shrimp boil recipe: Beer is pretty traditional. You could even do big jugs of a citrus white wine sangria (by Brown Eyed Baker). But if you, like me, prefer to stick to straight-up wine with festive dinners, I’d stick with white wine (even though there’s hearty sausage in the dish) and I would stay with something dry like an Italian Pinot Grigio or Australian Sauvignon Blanc. If you don’t mind going there, a dry Riesling (whcih will still be off-dry) would be gorgeous too. Check out this list of 5 great summer shellfish wines from Food and Wine. Yum! 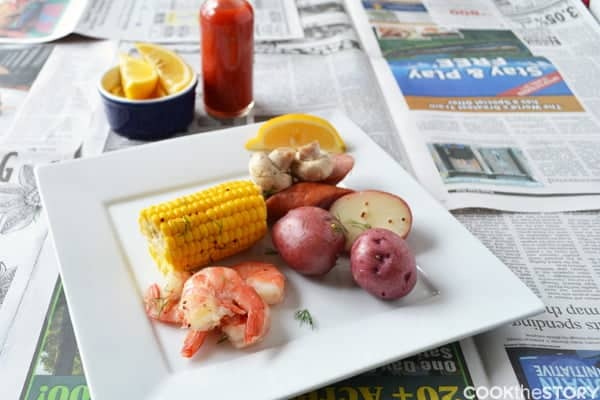 I love the spin on the classic shrimp boil! We both have shrimp boii on the mind. 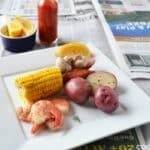 I’ll be the first to admit I’ve never done a true shrimp boil! Only on the grill! Must give our recipe a try! I love how you served this up by *dumping* it all in the center of the table and letting everyone have at it. While I can’t eat fish of any kind, your meal does look delicious and I know my husband would dive right in. As for the Pimm’s…a former co-worker of mine is British and we were served Pimm’s at a summer BBQ we attended at their home a few years ago. I enjoyed in very much. I LOVE Shrimp Boil!! Looks delish! I love my Pimms in the summer! 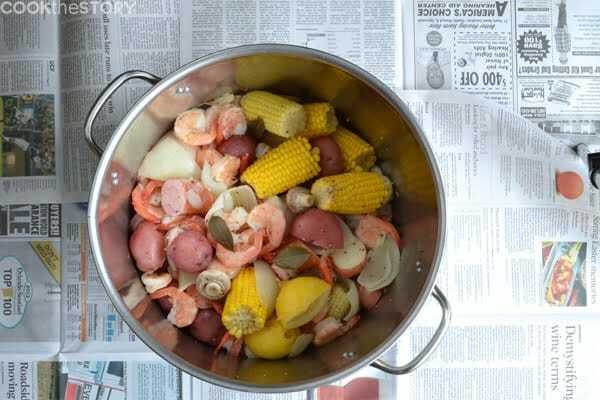 A shrimp boil is always a good excuse to throw a beach party. I have only really ever had Pimms when in the UK (except for the party I mentioned). I wonder why. You are absolutely right that it is the perfect summer drink. I’m going to make sure to find a bottle and play around with some cocktails this summer! What do you like to mix your Pimms with? 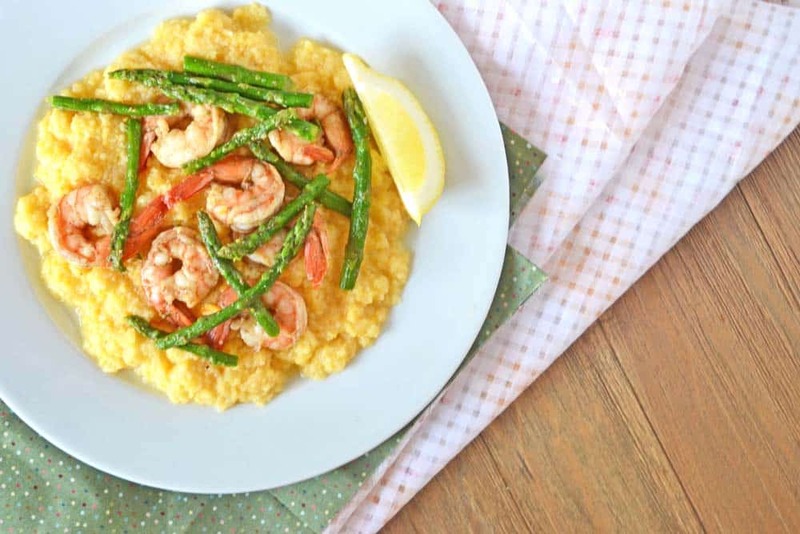 This is a very beautiful way of making the shrimps! I love them anyway prepared! I was lucky enough to be invited for dinner when this recipe was on the menu. It was delicious, colorful, and soooo much fun watching Christi dump it right onto the table. I will be making this for one of our dinner parties too. This looks wonderful! 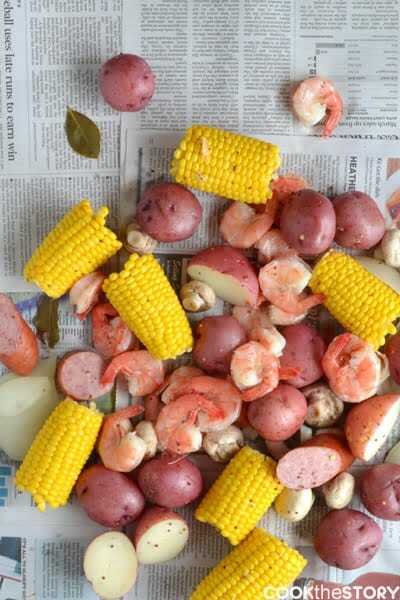 I’ve always wanted to so a shrimp boil! Thank you for promoting the giveaway too! So glad that I got to meet you this weekend! 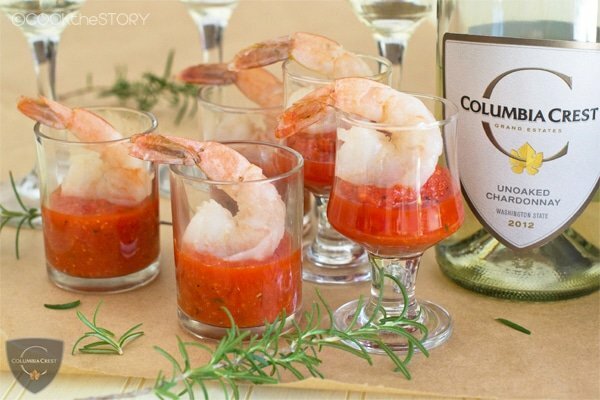 I love everything about this…shrimp boil, wine pairing, and info about the potato trip with Black Gold Farms! One of my favorite summer meals when we have company. Love this recipe, Christine! Beautiful!